For all those super cautious people in the world, let's ponder the question "Is Now The Best Time To Buy A Home?" I would think that if you are happy with where you live, then now is not the best time to buy a home. But if you have been contemplating a move, you might want to consider these two very strong arguments that support now as the best time to buy a home. There are personal reasons that should be the most important factors when you determine the best time to buy a home. But once you determine that you are ready to move and want to time the market, consider the message from the two graphs below. 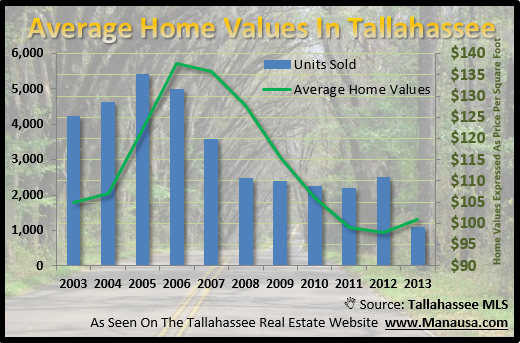 Some Home Values Are Rising - After six long years of declining home values, it appears the trend has turned for homes priced below $250,000 in Tallahassee. While high end homes are still dealing with over-supply and falling prices, homes valued near and slightly above the median are rebounding. Mortgage Interest Rates Are Rising - If you are borrowing the bulk of the funds for your next home purchase, then you should keep a close watch on mortgage interest rates. It appears as if the Federal Reserve is going to slow monetary stimulus, and the markets reacted fast to rumors with rising interest rates over the past few weeks. 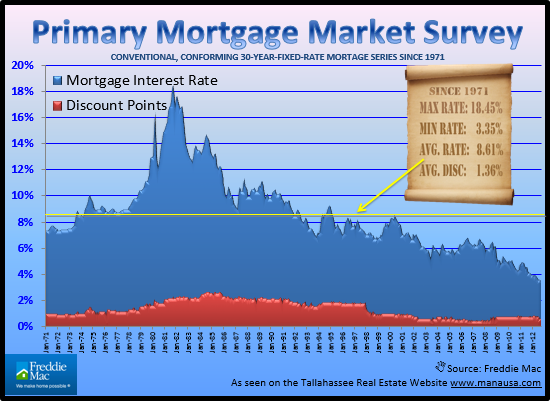 While there is no guarantee the lows are behind us, there are experts finally claiming that we have seen the bottom for mortgage interest rates. Since nobody has the luxury of foresight, only time will tell whether or not now is the best time to buy a home. But the evidence that we have seen above certainly makes a strong case for it. A 1% rise in mortgage interest rates right now would represent a 28% increase in the cost of funds for purchasing a home! So you have to ask yourself, what is more likely ... that interest rates shoot up above 4% or that home values will drop another 10%? This is why we study supply and demand so closely. Every price range, in every area has a unique supply and demand dynamic that will impact the direction of home value movement. So is now the best time to buy a home in Tallahassee? Most likely, unless you are paying cash. If you want help in determining if you should buy a home now or wait, just drop me a note and we can schedule a time to review your specific goals and needs.